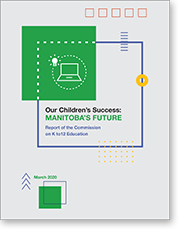 This paper sets the context for a comprehensive review of the Kindergarten to Grade 12 education system and introduces Manitoba’s Commission on Kindergarten to Grade 12 Education. It also provides an overview of the commission’s mandate and the processes it will undertake to engage Manitobans in improving student achievement and student outcomes. Manitoba students and their families deserve excellence in education. A strong education can set students up for success – in the workforce, in postsecondary education, and in life in general. The goal of this review is to find the best solutions for Manitoba’s education system to ensure our students can succeed in today’s global community no matter what path they choose. This report provides feedback to the people who participated in the January 2018 provincial summit on literacy and numeracy and context for Manitoba’s Commission on Kindergarten to Grade 12 Education as it undertakes a comprehensive review of elementary-secondary education. This document captures the timelines created by summit participants and presents the unabridged notes from the 100 group discussions. These records reflect the priorities identified by participants and the ideas, concerns, and recommendations that arose over the three days of the summit.